We can stop making science fiction films now. Arrival has said it all. Yes, there's a very healthy dose of hyperbole with that statement, but that doesn't make the overwhelming feeling the film conveys, directed by Denis Villeneuve and written by Eric Heisserer, any less resonant. Arrival is smart, simple sci-fi that never panders and never overstays its welcome, and, with Amy Adams on board to be our guide through the waterworks that are sure to come, it's one of the best science fiction films to come around in years and one worthy of the processing required. Emotional and daring in the most exquisite of ways, Arrival becomes that eye-opening tale of alien encounters and communicative sparring that leaves the viewer rattling the ramifications that follow around in their head for days, a key staple for any, good science fiction. 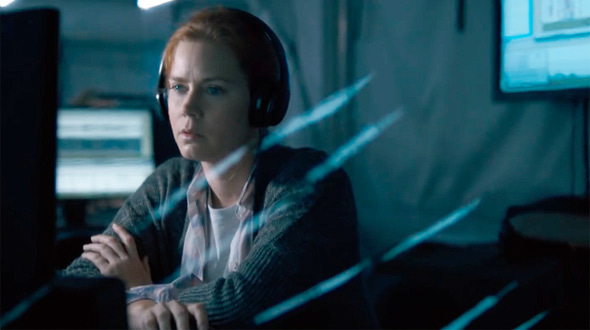 Based on the short story titled "Story of Your Life" by Ted Chiang, the film focuses on Dr. Louise Banks (Amy Adams), a gifted linguist whose universe is turned upside down when a dozen spacecrafts mysteriously enter Earth's atmosphere, seemingly choosing random spots on the map to touch down just ten feet off the ground. Banks, along with a mathematician named Ian Donnelly (Jeremy Renner), are called in by the military to open lines of communication with the planet's new visitors. Managed by the US military, namely Colonel Weber (Forest Whitaker), it's up to the scientists to figure out a means to communicate with these extraterrestrials and sort out their ultimate intentions - what do they want and are they hostile. It doesn't take long for Villeneuve's film to find its emotional core, with Banks' grief over the loss of her only child creating a state that has her living in the past as well as the present. It isn't a groundbreaking key to the film's emotions, but the director and writer's handling creates a genuinely impactful mental state in their protagonist that works wonders when mixed with the chilling alien presence. How it all plays out is even more overwhelming than its simple nature. Aided by breathtaking cinematography from Bradford Young and accompanied by a foreboding yet grounded, almost elemental, musical score by Jóhann Jóhannsson, Villeneuve's Arrival looks and feels like something we would have gotten from early Christopher Nolan. Comparisons to Interstellar are sure to be inevitable, but the story elements don't justify such a comparison, Arrival's narrative falling in line more with something like Michael Crichton's "Sphere" than anything else. In essence, though, Arrival is completely its own beast, a thought-provoking look at the science and politics involved when meeting an extraterrestrial race. The less said about them, the better. Instead, Villeneuve and company take the basic building blocks of the science fiction world and inject them into the very real world of today. The film says more about how we as people would react in 2016 to such a thing than any prescient vision of our future, and the alien's intentions, though not fully revealed at first, create an important dialogue for any living creature today. It certainly helps that Adams takes charge in the lead role, grounding those building blocks down to our most basic of human needs with dialogue and performance and letting that sensibility bubble up at every, nuanced moment. The actress says so much with a slight glance oftentimes without even any words to be said. It's a performance that, like the film itself, gets back to the basics of how it all works and creates a classical sense of understanding, something not many actors can pull off these days. Even fewer can pull this off while still conveying the tremendous power required to make it all resonate. Everything about Arrival is overwhelming, the moments of beauty mixing flawlessly with the science fiction tone with an almost magical touch. It's the kind of unique cinematic experience that moves the viewer to tears based on sheer beauty of the work alone, but what that work says and what it ultimately means are the elements out of which masterpieces are made. Denis Villeneuve, whose work in Prisoners and Sicario won't be forgotten any time soon, has made his masterpiece with Arrival. The ball is now in the court of science fiction as a whole to step up and prove itself alongside it. "We can stop making (bad) science fiction films now" There is enough room to make amazing sci-fi movies, if only they can adapt 1/1000th of what exists in sci-fi literature. Agreed. He admitted it was a hyperbolic statement! And I think this was what he was really trying to say... Let's hope this sets a new bar and sci-fi movies go even further from here. It is awesome to hear that I can get hyped about this movie, watching for screening dates in my country/city now!! There was no chance this was not going to be amazing. I am very happy for the future of Denis. Do they ever show the aliens entirely or just a shadow? Also do they look convincing or cheesy? They must have done wonders with the script I read, which was made for tv special melodrama. They story isn't really any different than The Day The Earth Stood Still meets Contact but I'm hoping for the best. The 2 movies are extremely similar. Both feature a parent/child relationship, just reversed between them, as the backdrop to meeting aliens and deciphering their language and secret plans, both of which are also the exact same. Finally saw the movie. It was ok. I enjoy the DP's work and the director's visual style but the script was pretty bad. In many way I was wrong and it's more of a ripoff of The Abyss (bit not as good) than Contact, although they all share many similarities in basic plot. The main characters were about as boring as it gets, I never felt any real connection between them, and actually both characters were completely selfish, both for different reasons-him for leaving and her for bringing a child into the world she knows will have a horrible early end. I'm not sure what people are seeing in this. IM glad you liked it though not trying to take a jab at you, I just was hoping for much more. Take care. You clearly did not understand the movie at all... Sounds like it went right over your head. But nothing to do if you are missing the brilliance of it. What did I miss since you are so brilliant? Please enlighten me Mr Hawking. You didn't even understand my comment. I didn't say I'm brilliant, I said the film is. You missed the entire thing. You missed the message, you missed the whole point of it. Read all the reviews about it, they explain quite nicely. I've read multiple reviews I saw the movie and I read the script please enlighten me. What's the message I seem to be missing? -That she would do it all over again even though she knows the outcome? no kidding. That's why I said she's selfish for choosing that path rather than thinking about her daughters life and her husband is also selfish for leaving and abandoning them. There was also basically zero chemistry between their characters and honestly the science and language stuff was glossed over and boring. The concept of a non linear language and time travel as a device was interesting but that's about it. Where am I wrong? She's not selfish, that's the point you're missing. And I can't explain it to you in a way where you'll understand it, it seems. You missed the line about "if you could see your whole life in front of you..." It would have been selfish of her NOT to have the child. She has the ability to see all of life, and yet she chooses to allow this person to experience a brief amount of it even though she knows the tragic outcome. That's beautiful. The fact that you think that is "boring" and "selfish" speaks more about you, and your misunderstanding of the entire film, than it does the film. I'm sorry, but your entire interpretation of the film is wrong.